This year, don't blow a bunch of money on Jack & Coke's. Spend the same amount but buy yourself, and some special company, a nice bottle of bubbly. Whether you're celebrating the passing of a great year, or the anxious welcoming of a stronger one, sharing a bottle of decent champagne serves as a tangible commitment to better things to come. Perhaps it's a fresh career, newfound health, or simply your first New Year's with someone special. Mark the moment with something befitting the occasion. Champagne, like all other alcohol, has a standard trajectory for beginners. It starts with only sampling $8-$15 bottles randomly and not understanding why anyone would spend a ton of money on one bottle. Is Johnnie Walker Black really worth double the price of Red label? Just something for old people to blow their money on, we all think at one point. This happened to me with champagne a few years ago, and since, have anxiously awaited any excuse for popping the cork from a bottle with the bright yellow label. After receiving a promotion and a surprising raise, the VP, a champagne fan himself, shook my hand, congratulated me and told me to go out and buy a bottle of Veuve Clicquot to celebrate. My complete newness to non-grocery store champagne and an obvious lack of familiarity with French led me to sheepishly ask him how to spell ‘Voove Clekoe'. But man am I glad I did. 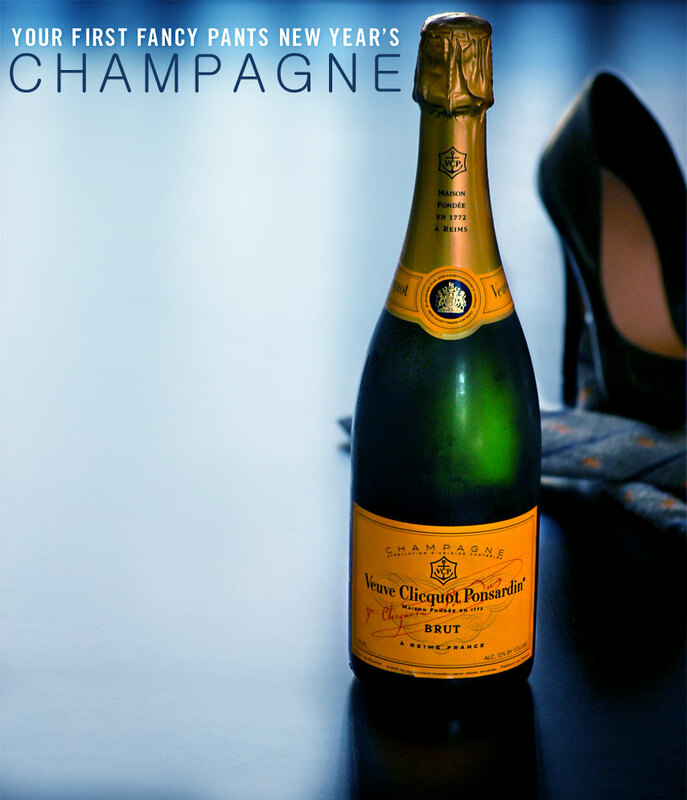 From fancy holiday parties, to small celebrations, “Veuve” as it's known, is the first choice for an affordable, celebratory bottle. Over the last few years or so, it's become the go-to “nice” champagne for the young professional set. I know this not because I'm a champagne connoisseur, but because since trying it, I've seen it excitedly welcomed at all events suitable for a nice bottle. No matter what your New Year's plans include, I hope you look your best and get to celebrate with something worthy of the occasion. From all of us here at Primer, have a safe and happy New Year. Your support is what makes it all worthwhile. I wish you all the best. Happy New Year! Just don’t let a girl try to open that bottle of champagne with a corkscrew only to hand it to you and have it explode in your hands.